It is going to be a tempestuous year with more developments in the social media scene, and a digital war may erupt between Internet users, companies and governments. 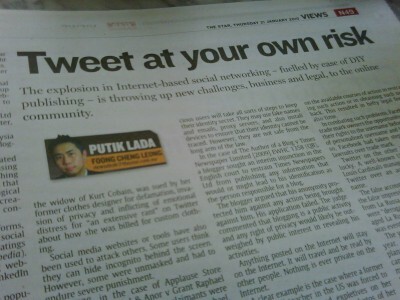 MALAYSIA’S social media sphere hit a milestone last year. Facebook users reached 12 million in Malaysia as at Decem­ber and Twitter users reached about 470,000 as at October. Defamation actions and criminal charges against people for alleged misuse of social media have also become normal. There have been interesting developments in the social media and Internet legal scene. Last year saw an increase in the use of social media by the legal profession to market their services. Some lawyers, law firms and courts have their own Twitter accounts. Former Bar Council president Datuk Ambiga Sreenevasan (@Ambiga_S) has over 6,000 followers, international law firm Allen & Overy (@AllenOvery) has more than 6,600 followers and the US Supreme Court (@USSupremeCourt) has 23,000 followers and counting. With such extensive use by legal practitioners, the Law Society of England and Wales issued a practice note for the use of social media by lawyers. Back home, Cybersecurity Ma­­laysia introduced a new Internet guideline called Best Practice on Social Networking Sites (SNS). The guideline is used as acceptable practices in usage of SNS with heightened ethics as well as in protecting the security of users and privacy needs. It is very useful for companies as guidance when drafting their social media policies. Interestingly, the High Court of Malaya recognised that misappropriation of a domain name by a former employee is actionable under conversion of and trespass to property and breach of fiduciary duty in the 2008 case of Ogawa World Bhd & Anor v Ch’ng Wai Loong. Normally, misappropriated Top Level domain names are recoverable through the WIPO Arbitration and Mediation Centre. In Canada, the Su­­preme Court of Canada in Crookes v Newton (2011) delivered an important decision on the status of hyperlinks. The Court held that creating hyperlinks to allegedly defamatory articles does not amount to a publication of defamatory information. In India, the owners of a hotel sued Google over the auto-complete function on its search engine for defamation. When users typed the hotel’s name into Google, the word “receivership” is a suggested search term. However, the suit was later withdrawn. “Who owns your followers?” was an issue to be determined when mobile phone website PhoneDog sued a former employee, writer Noah Kravitz, over the 17,000 Twitter followers that he had built up on a Twitter account called @PhoneDog_Noah. Noah filed a motion to dismiss PhoneDog’s case but the US District Court ruled that PhoneDog could proceed with the lawsuit. Many commentators are of the opinion that PhoneDog should have established a social media policy to determine the issue of ownership of the Twitter account when the account was created. In a similar case, Eagle v Edcomm, Inc, et al., the Eastern District Court of Pennsylvania held that a former employee’s LinkedIn account be­­longed to the employer, even though the LinkedIn account contained the name, professional history and accomplishments of the employee. Facebook had a busy year in 2011. Friendster repositioned itself as a social gaming site and discontinued its user social network accounts, leaving Facebook with one less competitor. However, Google introduced a new social networking site, Google Plus. Facebook was subjected to a thorough and detailed audit by the Office of Irish Data Protection Commissio­ner, which gave a dozen recommendations for how Facebook can im­­prove privacy protection and data-handling practices. The audit report is available online in the interest of transparency. Last year also saw the battle for Facebook page www.facebook.com/Merck. Merck KGaA, a German drug maker, suddenly lost its Facebook page to US rival Merck & Co.
Merck KGaA initiated an action against Facebook for details on how the page was lost. Facebook subsequently apologised to Merck KGaA for the mix-up. We all know that it is very difficult to remove information published online. Some argue that confidential information posted online will lose its quality of confidence. However, in AMP v Persons Unknown (2011), the UK High Court granted a superinjunction to restrain the further publication of stolen intimate pictures of a woman which were leaked online. Arguably, this case implicitly determined the position of confidential information which has been leaked online. On the criminal front, a US Federal Judge in USA v William Lawrence Cassidy dismissed a criminal case against Cassidy for “tweet stalking” a religious leader on Twitter. Cassidy allegedly posted 8,000 tweets, almost all of them about the leader and her religious group, which caused the leader to claim that she had suffered “substantial emotional distress”. The Judge held that although the tweets were uncomfortable, Cassidy’s right to tweet was protected under the US Constitution. This year will see more developments in the social media legal scene. We may also see more Internet censorship and crackdowns on websites for sharing files – just like what happened to MegaUpload. As a result, a digital war may erupt between Internet users and companies and governments. It is going to be a tempestuous year ahead.